Paris: Momentum is easing across the world’s major economies, according to a gauge the OECD uses to predict turning points.The Composite Leading Indicator is the latest sign of a synchronized slowdown in global growth, adding to recession warnings sparked by industrial figures in Germany last week and slumping trade figures for China earlier on Monday. The indicator, which is designed to anticipate turning points six-to-nine months ahead, has been ticking down since the start of 2018 and fell again in November. The OECD singled out the US and Germany, where it said “tentative signs" of easing momentum are now confirmed. Just two weeks into 2019, the OECD economic indicator follows a run of numbers that mean growth this year could be even slower than currently anticipated. For Bloomberg Economics, the data point to “slowdown, not meltdown," but it still says the loss of momentum is “striking." Trade-tensions with the US are showing up in data. Chinese exports slumped 4.4% in December from a year earlier, marking the worst performance in dollar terms since 2016. Imports also dropped the most since 2016, hinting at softening demand at home that could have implications for exporters to China. The numbers sent stocks lower in Europe and Asia. The Stoxx 600 Index was down almost 1% as of 12 pm Frankfurt time. 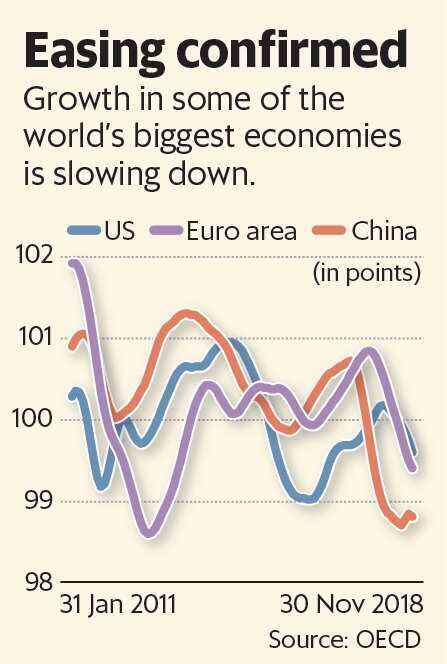 Industry in the region’s major economies had a grim month in November. Output declined 1.7%, with a slump in Germany sparking talk that it could shrink for a second quarter, putting it in a technical recession. There are also concerns about Italy’s economy, while riots and protests in France have hit growth there. Federal Reserve policy makers have taken note of the changed outlook and suggested they could pause their interest-rate hike cycle as they await clarity. Chairman Jerome Powell said last week that the Fed can be “patient and flexible and wait and see what does evolve."